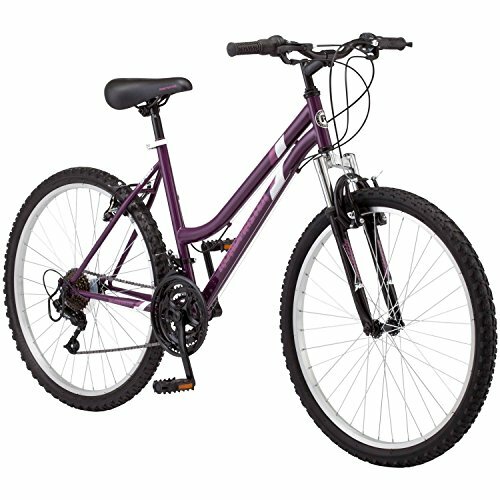 The Granite Peak 26-inch Women's Mountain Bike by Roadmaster is an excellent all-around mountain bike that is right at home on a rugged unpaved path or cruising the streets in your neighborhood. It sports a steel mountain frame and a front suspension fork, ensuring that each ride is comfortable and easy to navigate. The knobby tire treads provide plenty of security on pavement or dirt roads, while alloy rims offer added durability and stability. This 24-inch mountain bike comes with 18-speed twist shifters and a Shimano rear derailleur, allowing maximum shifting performance out on the trail. Experience the freedom of taking your Granite Peak all over town. Roadmaster has been a trusted American value in recreational bike riding for decades - have some fun on your next ride. If you have any questions about this product by Granite Peak, contact us by completing and submitting the form below. If you are looking for a specif part number, please include it with your message.